Apart from the irritation that forces you to scratch, you may experience flaking, redness, scaling, discoloration or even hair loss. If you’re constantly scratching despite many anti-dandruff shampoos then it may be more than simple dandruff. The causes of itchy scalp range from simple dandruff to fungal or bacterial infection to more serious autoimmune diseases. 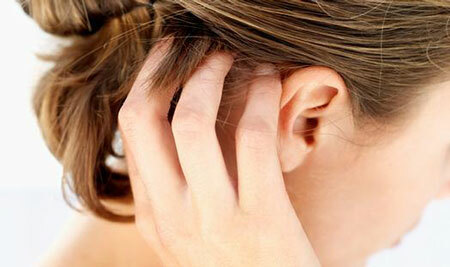 If you often wonder – why does my scalp itch, you may need to consult your doctor. Tinea capitis is the term used for the fungal infection – ringworm affecting the scalp. You may experience intense itching along with scales and round eruptions on the scalp and round patches of hair loss over affected area. Commoner in children, the infection can spread from one person to other via pets, and by sharing pillows, hairbrushes, and clothing. Is recurrent dandruff and flaking despite all antidandruff shampoo brands tiring you? Then chances are that you are suffering from Seborrheic dermatitis, one of the five common causes of itchy scalp. Seborrheic dermatitis is one of the leading causes of flaky dandruff and occurs in all age groups. Scratching your scalp often can lead to hair fall. Seborrheic dermatitis is thought to be due to a combination of an over production of skin oil called as sebum and irritation from a yeast called malassezia. If yes, you may be at risk for developing Seborrheic dermatitis. Psoriasis is a chronic autoimmune condition which usually affects skin and scalp. You may experience dryness and itching of the scalp accompanied by scales or flakes. Very often scalp psoriasis is misdiagnosed and treated as dandruff. But in scalp psoriasis, you might notice red shiny raised circular patches on the scalp or on margins of hair. Hair fall is very common in scalp psoriasis. There may be super added fungal or bacterial infections. It may spread to other body parts as well. Folliculitis is an infection of hair follicles usually due to the bacteria Staphylococcus aureus. You may notice small or large, pus filled eruptions on the scalp along with intense itching. Sensitivity to certain products can lead to irritation, redness, itching and scaling of the scalp. Hair products like dyes, shampoos, conditioners, hair colours, straighteners, permanent weave solutions, tonics, etc could be the cause of allergy. Other causes for itchy scalp are head lice, dry weather (winters), dry scalp, poor hygiene, diet low in vitamins and minerals. Treatment for Itchy scalp depends on what underlying condition you are suffering with. Homoeopathy offers excellent treatment in case of chronic and recurring conditions. Homoeopathy can effectively treat Tinea capitis and alopecia developed due to that. Psoriasis on the scalp responds very well to homeopathy. The recurrence is brought under good control. Homeopathy offers an excellent treatment for Seborrheic dermatitis during all stages. Homoeopathy offers wonderful results in case of recurrent folliculitis and stops hair fall. Dr. Rajesh Shah has been working for chronic, recurring and autoimmune diseases since more than 30 years now. Research based medicines at LifeForce will help you to get rid of itchy scalp from the root.